ARCATA – International Super Clown Shea Freelove says it was a rare Bigfoot sighting in the Arcata Community Forest that led him to create Circus Emporium at 1047 Sixth St. “I saw a large hairy man foraging through the underbrush,” says Freelove. He rushed to open the camera application on his mobile phone, but to his dismay, the large hairy man disappeared before the software could load. Since then, Freelove has been on a mission to create an interactive curiosity experience for the community, a mission that led to Circus Emporium, a mind-boggling collection of circus memorabilia, collectibles and curiosities a decade in the making. “I have been curious about the curious for a really long time,” quotes Freelove. In remodeling the property, Freelove made a remarkable archeological discovery – the remains of the legendary Ouroboros! Freelove immediately began archeological evacuations of the backyard, unearthing an array of mysterious items; bat boy, Fiji mermaid, raptor eggs and even Bigfoot tracks were reportedly found on the site and are all now on display at the Circus Emporium. 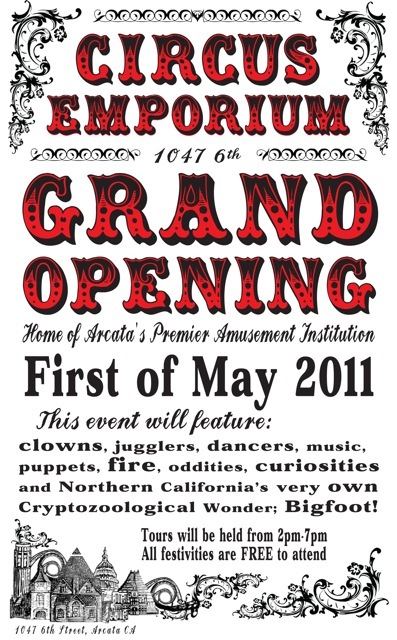 Circus Emporium will be hosting a grand opening on Sunday, May 1, 2 p.m. to 11:30 p.m. Tours, interactive projects, games and activities for all. For more information, pictures and more back-story, see “Circus Emporium Grand Opening” on Facebook, or contact Shea Freelove at (707) 845-5842, freelovecircus@yahoo.com. Circus Emporium is a project of the Arcata Amusement Institution, a non-profit DreamMaker project administered through the Ink People. This entry was posted on Saturday, April 30th, 2011 at 9:48 am	and is filed under Community, Scene. You can follow any responses to this entry through the RSS 2.0 feed.